Cheyletiellosis is a highly contagious skin parasite of dogs, cats and rabbits caused byCheyletiella spp. mites. It is also referred to as "walking dandruff" due to the appearance of the large, whitish mites as they crawl across the skin and fur and the excessive scaling that accompanies the infection. What are the clinical signs of cheyletiellosis? The most important clinical sign of cheyletiellosis is scaling or dandruff. The scales are diffuse and often appear as large flakes. They are most commonly seen on the back and upper part of the body. Pruritus or itching may occur to a variable degree. How does a dog become infected with cheyletiellosis? Most dogs contract "walking dandruff" from other pets at animal shelters, breeders and groomers or other areas where numerous dogs have contact with one another. Diagnosed is based on medical history, clinical signs and observation of the mite. Due to the large size of the skin mite, it is easily seen under a microscope set on low magnification. "Clipping of long hair to facilitate removal of the mites." Treatment requires clipping of long hair to facilitate removal of the mites. 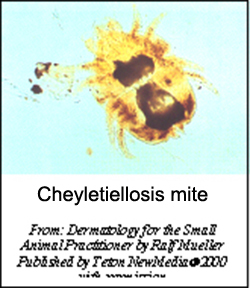 A variety of topical treatments are available for the treatment of cheyletiellosis. 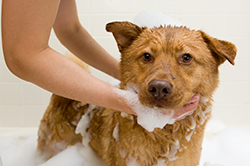 Most pets require six to eight medicated baths given once a week to remove the scales and mites. Lime-sulfur and pyrethrin rinses are commonly used in cats, kittens, puppies and rabbits. Pyrethrins or organophosphates may be used in adult dogs. Routine flea sprays and powders are rarely effective. Alternative treatments such as fipronil or ivermectin may be recommended by your veterinarian. These drugs, though often effective, are not approved for use in the treatment of cheyletiellosis and your veterinarian may require you to sign a disclosure and informed consent form prior to their use. Can I get cheyletiellosis from my pet? You can get cheyletiellosis from an infected pet. The infection is self-limiting since you are an accidental host and complete resolution occurs within three weeks after your pet and the environment have been treated. What is the prognosis for cheyletiellosis? Cheyletiellosis has an excellent prognosis for complete resolution provided you follow your veterinarian's treatment recommendations. "Thorough cleaning of all bedding or other surfaces that an infected pet has had contact with is an important step in eliminating this parasite." Thorough cleaning of all bedding or other surfaces that an infected pet has had contact with is an important step in eliminating this parasite. Recurrent infections indicate contact with an infected carrier (some of which may have no clinical signs) or an unidentified source of mites such as untreated bedding.